A pet boarding and day-care facility, Cuddle Inn is where you can leave your pets without having to rely on friends and neighbours while you are out. This is now available in almost all metros for those lovely pets of all breeds and sizes. 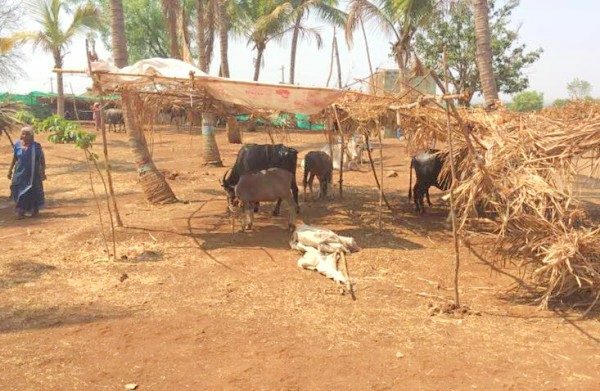 In a remote village situated in Chikkodi Taluka has a day care shelter for the cattle. Yes its true, with the heat beating hard and sources of water drying out too fast, the villagers of Belagali and Umrani have no choice but to send their cattle to the day care shelters where they get fodder and water. The shelter has about 100 cattle. If the cattle are not cared for they end up at the slaughter houses, but this day care shelter started by the Government is a welcome sign for these poor animals. Here the government provides fodder and water to the cattle, the farmers being the cattle here , they are fed and given water by the government , the cattle stay here all day and in the evening return to their houses.But sometimes water is not available and all cattle have to wait to quench their thirst. Pyaas Foundation while on survey found this place and now plans to commence supply of water tankers to this day care shelter if there is need. Pyaas foundation has started to supply tankers to neighboring villages namely Belagali, Umrani & Nagarmunnoli making it 20 tankers a week to begin with.